TRACKS Youth Program came back strong this summer. After a bit of a hiatus and the hiring of fantastic new coordinator staff, this program returned to deliver critical programming to youth across North Central Ontario. TRACKS is a unique organization, aiming to intertwine Indigenous Knowledge, Western sciences, and our own experiences with the deliberate and cautious skill of a Grandmother braiding sweetgrass. This weaving allows us to develop a multi-dimensional program that engages youth in cultural and interpersonal reconciliation. Over the last two months I have had the absolute privilege to be employed by this organization. My name is Alex Roper... let me tell you all about my summer. We began with a fantastic training program for our staff that bridged old TRACKS traditions with fresh and exciting ideas from our diverse and expert staff team. With a quick start, our educational programming began in distant Durham District School Board where we shared with various youth groups the importance, and sacredness of water, turtles and wetland ecosystems. Next we travelled to Mississauga of Scugog Island First Nation, where we provided custom programming to a small group of youth at their beautiful community center. Next we had a chance to work in our own backyard and welcomed youth from across the Kawartha Lakes region to Trent University where we had an action packed week of learning and activities. We finished our summer with programming for Curve Lake First Nation, which involved travelling to Curve Lake for two days and spending two days here at Trent University. Throughout the summer season the Oshkwazin staff connected with the TRACKS education team so we could learn how best to engage Indigenous youth in Peterborough and connect them to meaningful learning and future employment. Seems like a lot? Well we were busy, but we also took critical time to reflect, rest and recharge; developing new programming, forging old workshops into tremendous and effective programs; knocking away old pieces and adding in the new. Our small team has truly come together and contributed to work that we can be proud of. Ferns and flowers were sprouting all around us, low hanging branches of birch trees rustled in the wind. A fragrant smoke rising from a multi-chromatic conch shell. Every morning we entered this natural courtyard, every morning we cleansed away the negative energies, put our intentions towards our work and shared our feelings, our struggles and our apprehensions of the day. Every morning we smudged. I had not been common to the practice prior to my employment but now everyday that I go without it, I miss it. To stop for a moment and connect with the traditions of the people who have lived here so long is like tying yourself into the threads of the great tapestry of history, the history of the land. Our training was very grounded in these actions, our incredible staff team of both Indigenous and non-Indigenous workers were incredibly respectful of these teachings and learned them either from each other, or from knowledge holders across our community. This includes elders, scientists, professors and other experts across various fields. We had discussions with our Advisory Committee, which includes many professors at Trent from various departments, which clearly set the vision for this program and laid bare many of the roads we would have to walk to bring this vision into reality. We met with previous TRACKS staff members, who detailed how workshops had been run previously, which stories to tell and where many of those stories came from. We met with other knowledge holders in the community, whether that was the people at the Ontario Turtle Trauma Center, the rooftop gardeners at Trent University, the medicine garden workers at First Peoples House of Learning or the many other community members we engaged with. Through these meetings our staff had the chance to learn, ask questions and pass on what we had gained to the youth we would be working with all summer. This was our training and we engaged deeply with this learning and internalized the lessons and the knowledge to the best of our abilities. Most importantly we laughed, grew together and built a strong team. Delivering knowledge was only half of the job. We also had to develop teamwork to support each other through the tiring but rewarding work of youth development. For older youth, I would sometimes challenge their perception of the objective truth of Western sciences, asserting the need for two eyed seeing, a lesson passed to me by one of our staff members. The concept is simple. Science is one eye, traditional Indigenous knowledge the other. With one eye open we see a two dimensional flat image, void of depth, meaning and context. When we use both eyes, we can see the whole picture, context is provided, and bias of history, tradition and knowledge is put into context. This was the careful weaving we were engaged in, we had to be cautious not to pull too hard, not to damage the braid with the vigour of our intertwining. We first learned to walk that line in Durham, and we continued to walk through the entirety of the summer. Going to Mississauga of Scugog Island First Nation was our first educational outreach that took us into an Indigenous community. Our education staff this summer was predominantly white settlers. Myself, our coordinator and our two other daily Education staff members are all white settlers and we relied on the teachings from our Indigenous co-workers in Oshkwazin, as well as local knowledge holders, to provide us with cultural context and training. With this knowledge passed to us we felt well prepared, but still a bit nervous entering into the community. We aimed to provide quality programming, a fun week and critical knowledge all delivered in a culturally sensitive way. We had the additional good fortune of having the help of two amazing young Indigenous women in our community, both still in highschool who worked with TRACKS through the Focus on Youth program. These youth proved their fantastic interpersonal skills during our week at Scugog First Nation. They built strong relationships with the youth there, and helped to not only deliver critical teachings but also to act as role models for the youth involved in our program. One of the most powerful moments of the program was definitely when an Indigenous Elder came and delivered Nibi teachings to the youth. We sat with her outside at the Scugog powwow grounds, a pavilion with its rooftop covered in cedar and painted in the colours of the Medicine Wheel. The youth learned about the copper carrying vessel, and how Indigenous people have used copper to carry water for a very long time, long before copper’s antimicrobial qualities made it a favorite for plumbing in our cities and towns. I learned a lot about programming during my work in Scugog and it was fulfilling for us to deliver a quality camp experience to the youth of this community. Next came Trent Camp week. We were on our own turf and delivering some new programming. During the week we had the opportunity to work with some really fun partners. The Peterborough Rowing Club provided our youth a chance to test concepts of buoyancy for themselves out on the Otonabee river by using their Olympic-style row boats. Additionally, we explored the world of Turtles with a visit from the Kawartha Turtle Trauma Center who provided an incredible experience for our campers. We got a chance to meet some turtles from the center, including Rusty the Wood turtle, Paddy the Snapping turtle and Andrea, the Blanding’s turtle. These little one’s stories and resilience engaged the youth so that they were adamant about helping to stop the tragic issue of roadside turtle deaths across Ontario. We also had the opportunity to travel to Petroglyph Provincial Park during our Trent Camp week. There we learned the incredible history of the Petroglyphs, marking thousands of years and older than even the earliest Norse visits to North America. We walked the Nanabush trail, exploring the natural area and discussing the critters we saw along the way. A good friend of TRACKS and expert woodsman, Beedahbin, was kind enough to come with us and share his knowledge on ethical harvesting, including chaga mushrooms and sweet fern. We also explored Trent University’s incredible natural spaces. We went on a hike up the Drumlin where we taught the students the geographic history of the Trent River valley and the Wisconsin Ice Sheet that left the Drumlins here for us to visit. We also had a chance to visit the Trent University Rooftop Garden, where our youth learned about companion planting, local flora and fauna, and had a chance to test their knowledge with a rooftop scavenger hunt of the garden, finding both it’s animal and plant residents. We had a whole week to work with these youth and got to know a lot of them very well. This week saw us connect to the Peterborough community and tap it’s vast resources of knowledge and expertise. Our youth had an incredible time and our staff felt like we really hit our stride by this point in the summer. Our outreach to Curve Lake First Nation was one of the last programs we ran this summer. While at Curve Lake we had the chance to do some of our classic workshops, including our Strawberry DNA extraction workshop, which never fails to get some sincere ‘wows’ from the youth engaging in the activity. We visited the beautiful and bountiful Gitigaan behind the Whetung Cultural Center as well where the students were able to explore the garden and find various plants and pollinators. Thomas Olzewski spoke of his efforts to bring beans from the Hopi people to Ontario, plan the garden around climate change impacts, and establish food sovereignty in communities such as Curve Lake. We also played games with the campers, including the Food Chain Survival Game, where youth were divided into Herbivores, Omnivores and Carnivores. They ran through the woods, simulating the natural food chain and we introduced contamination at the watering holes and other man made obstacles while discussing parallels to the ecosystem around us. Here we carefully braided in Anishinaabemowin names, stories and teachings with Western Science such as the biological explanations of food chains and ecosystems. We also tied in our own personal knowledge from past work experiences with youth. This allowed us to deliver programming that was engaging, culturally informed and scientifically sound. We also had a chance to work with the youth on arts and crafts, such as dreamcatchers, teachings that were covered by our young Indigenous staff members. We spent the last few hours of our time at Curve Lake working with youth on these cultural art projects on Daycare Island, in the middle of beautiful Buckhorn lake. I have made some mention of the Oshkwazin staff that work with the TRACKS program. These fantastic folks have worked very hard to compile Indigenous knowledge from reliable sources, providing us education staff with the stories and teachings we need to meet our goal of carefully braiding together knowledge systems. They were often attending meetings, gatherings and travelling to develop the knowledge base needed to support us in our work this summer and to develop a youth program that will support Indigenous teens in the Peterborough community during the school year. Their work is incredibly important and I would like to take this opportunity to thank them for their support, their teachings and their patience this whole summer. Our educational programming would have been so much more difficult without the behind the scenes work of the Oshkwazin team. I have provided you with a little glimpse into our education work this summer, including the programs we ran and the work we did with youth. However, we also did a lot of work back in the office, work I think should become more routine for those engaged in youth work. We often had time to reflect, revise and redevelop our programming as the summer moved along. Things that worked well, we highlighted and wrote out for future staff to use. Things we found ineffective we cut, shortened or adjusted so that our programming will only improve as our organization becomes more established and connected in the Peterborough community. This job has meant the world to me this summer. I have dumped my energy, enthusiasm and love into this work and it has fed back to me such beautiful moments of growth, for myself and for this community. 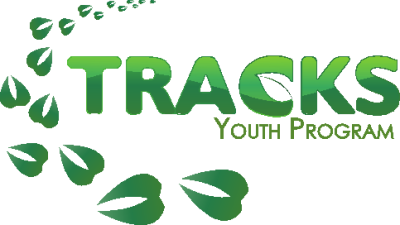 I am truly blessed to have worked with TRACKS this summer and hope that all of you reading this will consider supporting this fantastic organization, in any way that you can. Chii miigwetch for reading!